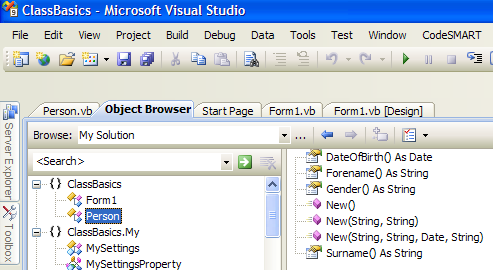 You can view the parentage of the Person Class in Visual Studio by using the Object Browser. 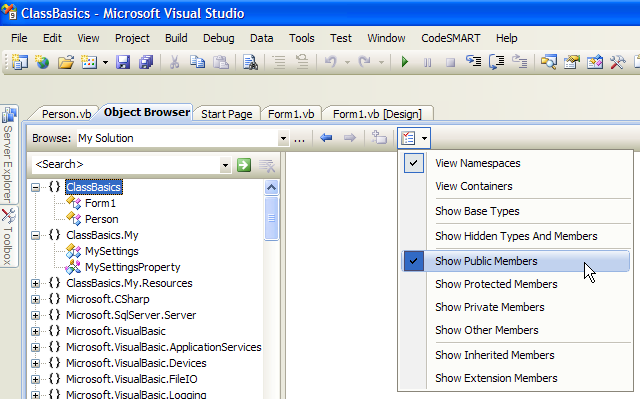 You can bring the Object Browser into view in Visual Studio by selecting View | Object Browser from the menu in the IDE. It is even easier to use the shortcut key - F2. 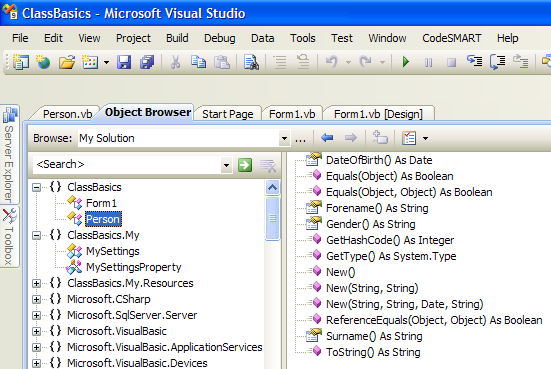 In the screenshot above, the first line is the name of the namespace. 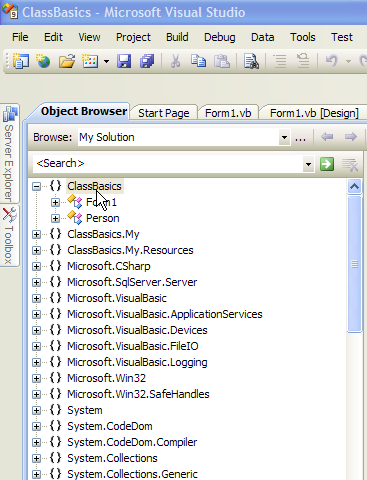 Then we have the Form1 class and the Person class as the next two items in that list. If you next click on the word "Person" on the fourth line of the Class listing at the left hand side of the Object Browser (or click the plus sign to the left of it), you will see an immediate change to what is shown in the right hand pane. That list of class members in the right hand pane is of course the four Public Properties and three Constructors that have been created previously. We will deal with 'Overridable' shortly, but for now note that this Public Function is a member of the System.Object class. 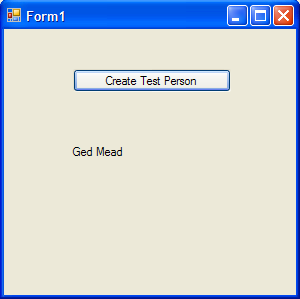 And because Person inherits from System.Object, the Person class too has a ToString method which initially is the same as its parent's ToString method. 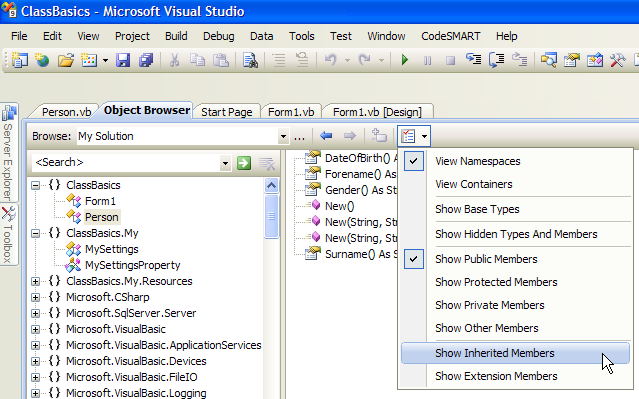 I am going to walk through this inheritance chain again in more detail in a moment, but before leaving the Object Browser, you should note that if you double-click any of the members of the Person class, you will immediately be taken to the code line or block of that particular member in the Person.vb file. (This doesn't apply to the members of the parent class, just Person). As you can see, the System.Object.ToString method will return the Type name, which of course is "System.Object". 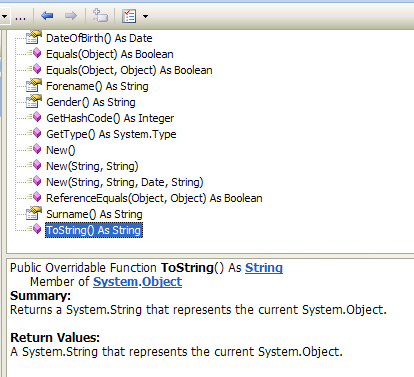 Now if you transfer this logic to the Person class that we created (which inherits directly from System.Object), the inherited ToString function will again return the Type name. 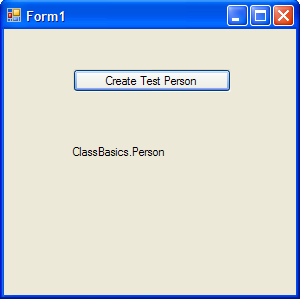 This time though the Type name will be "ClassBasics.Person" . So we've come full circle and arrived back at the unhelpful Person.ToString method. It's important that you understand how and why we get this result and I hope that the previous explanations will have clarified this for you.